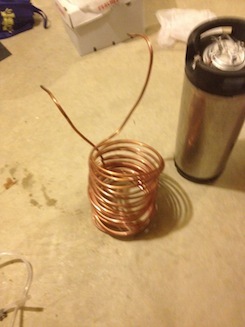 One of the first DIY home brewing projects I undertook was building a immersion chiller. This is one of the easiest project you can do. My first attempt was a fairly sloppy mess. Because I wasn’t patient, and I didn’t have a good form to use to keep the coils organized. Also, I was trying to fit the cooler into a much smaller kettle, so I squashed it to fit. This past brew session while cleaning up, I decided to fix it up. It was pretty easy to loosen it up, and rewrap it around a keg to get approximately the right shape. 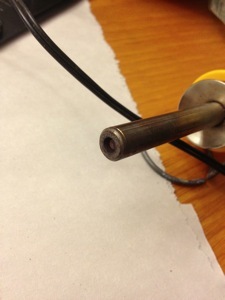 I did a little weave with the inlet to provide some stability to the chiller, then reattached the in and out tubes. It still needs some type of bracing to keep it sorted, any Ideas?